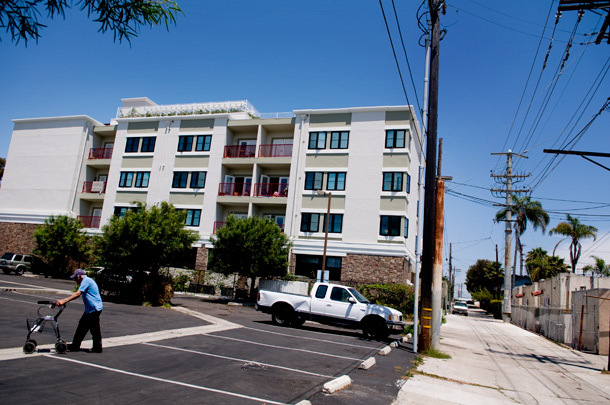 Mayor Kevin Faulconer’s proposal assumes that freeing developers from requirements to include parking in new housing projects may clear the way for smaller, more affordable units. Mayor Kevin Faulconer is placing a bet that axing required parking for new housing near transit will deliver more homes at a lower cost and reduce San Diegans’ reliance on cars. The city has long required home builders to incorporate parking in their projects. Last month, Faulconer announced a plan to eliminate that mandate within a half mile of transit hubs and unbundle parking from new multifamily projects in those areas. His plan would also compel projects near transit to add amenities such as bike storage, subsidized transit passes or other options. Builders could still include parking if that’s what they decided buyers and renters wanted. And the people who live in the new buildings may very well still drive or pay for parking options. But the mayor’s proposed regulatory rollback aims to let the market, rather than the government, dictate what’s produced. If builders have to include parking spots, they will likely build larger housing units that cost more and can help them pay for the total construction. The current code requires builders to provide at least one or two parking spaces in areas near transit. The theory is that freeing them of this requirement may clear the way for smaller, more affordable units and lower the hurdle people with low incomes must overcome to get into new housing. “You will all of the sudden be able to do zero parking as long as you’re in a transit priority area,” said Mike Hansen, the city’s planning director. Cities including Portland and Seattle have approved similar policies that apply to many new projects, and San Francisco on Tuesday became the first major city to eliminate parking minimums throughout the city. Faulconer’s team expects to send the proposal to the San Diego City Council this spring. If the Council approves the mayor’s plan, it would be one of his administration’s most substantive housing reforms. The reforms in San Diego and elsewhere are partly inspired by a movement to eliminate requirements that can add tens of thousands of dollars to the cost of each apartment or condo in a development. San Diego officials estimate a single parking space can cost $35,000 to $90,000, a hefty sum then factored into rents and housing costs. San Diego bureaucrats are also focused on meeting a Climate Action Plan target to cut greenhouse gas emissions in half by 2035, and have concluded that San Diegans must dramatically curtail car trips to help the city meet it. They believe increased development near transit stops will help. Homebuilders, planning wonks and even progressives who don’t always align with Faulconer have cheered his proposal. The development community has been particularly supportive. “Putting these incentives to produce more housing along transit lines could help go toward achieving their (environmental) goals and go toward our goal to produce more housing that working families can afford,” said Matt Adams, vice president of the Building Industry Association. Developer and architect Andrew Malick, who focuses on small and mid-sized projects, said he also considers the mayor’s proposal a potential gamechanger. Malick concluded in an analysis shared with the planning commission earlier this year that the average size of developable lots in areas near transit in the city is just 11,700 square feet – meaning there’s little space for parking. He said reducing parking requirements, which also has the benefit of substantially reducing project costs, will help developers experiment with projects that come with fewer on-site parking spaces, particularly in smaller lots and projects. “To allow the developer the flexibility to test the market is really powerful,” Malick said. Malick and others emphasize major change won’t come overnight. Adam Covington, California development director for large-scale mixed-use developer StreetLights Residential, said he backs Faulconer’s proposal but predicts it will be difficult to significantly decrease parking in many projects early on. Covington said his experience with projects even in dense neighborhoods such as Little Italy and Bankers Hill has taught him that residents tend to work in other neighborhoods and would need easy access to reliable transit and nearby amenities such as grocery stores and childcare to feel comfortable without a car – the sort of amenities that the city also plans to encourage with the new regulations. “San Diego infrastructure is just not quite there yet,” Covington said. Like any proposal in San Diego that involves potential parking reductions, the mayor’s pitch is also likely to face opposition from concerned residents and businesses. There were hints of that last month when the mayor announced his plan on social media. “Good luck finding a parking spot,” one Facebook commenter wrote. But city officials say data they have gathered revealed San Diegans may already not need as much parking as they think. Before they crafted the proposed policy, the city hired local transportation consultant Chen Ryan Associates to study parking policies in peer cities as well as parking patterns in 35 of San Diego’s so-called transit priority areas. Alyssa Muto, the city’s deputy director of environment and mobility planning, said that research revealed the demand for parking in areas near transit was largely below even the lowest levels the city studied – a result that opened the door to the proposal to remove parking requirements altogether in those zones. “That’s what gave us the green light to look forward versus just where industry or development is today,” Muto said. City bureaucrats, developers and other experts acknowledge parking changes aren’t a silver bullet solution to the city’s housing or climate woes. They don’t expect builders to instantly stop incorporating car parking in their projects – or an immediate, dramatic uptick in housing projects or transit use. The city also hasn’t set targets or predicted the changes it could see from the new regulation. Instead, officials are focused on the holistic goal to incentivize alternate forms of transportation, lower-cost housing options and increased development near transit as the city and its housing market change. “It’s really looking forward at what our lifestyles will be like in the future,” Muto said. Indeed, Colin Parent, executive director of the mobility-focused nonprofit Circulate San Diego, predicted developers will for now continue to pitch projects that include parking if the regulations are approved next year. “I think probably what you’ll see is you’ll see more developments with some parking, just less than they would have had before,” said Parent, whose organization backs Faulconer’s proposal. More dramatic change will likely take years. Portland’s principal planner Eric Engstrom, whose city implemented parking reforms that served as a model for San Diego’s proposal, said the city initially saw little change after it eliminated parking requirements for some developments. It took real estate investors and banks that finance projects some time to get comfortable with the idea, he said. Now, Engstrom said, developers build an average of one space for every two units they produce. Some buildings have no parking. Most others have about one space per unit. Many residents of those new buildings still own cars, and there have been complaints about parking congestion in some neighborhoods. But Engstrom said the parking reforms seem to have encouraged more transit use to and from work while reducing the cost of housing – a tradeoff that he said politicians have described as the price for a more sustainable economy. If Faulconer’s proposed changes are approved, Muto said the city will watch closely to ensure the new regulations are working.